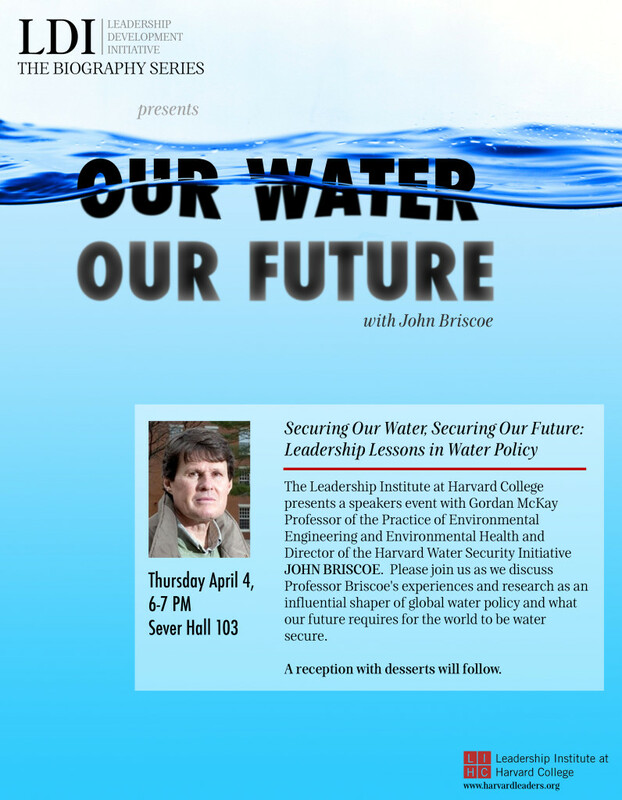 John Briscoe is Gordon McKay Professor of the Practice of Environmental Engineering and Environmental Health at Harvard University where he directs the Harvard Water Security Initiative. He teaches undergraduate and graduate courses on water management and development. In 2010 he was nominated for the Joseph R. Levenson Prize for exceptional teaching of Harvard undergraduates. Briscoe’s career has focused on the issues of water, other natural resources and economic development. He has worked as an engineer in the government water agencies of South Africa and Mozambique; as an epidemiologist at the Cholera Research Center in Bangladesh; and as a professor of water resources at the University of North Carolina. In his 20-year career at the World Bank, he held high-level technical positions, including Country Director for Brazil (the World Bank’s biggest borrower). Mr. Briscoe’s role in shaping the governance and strategy of the World Bank is the subject of a chapter in the definitive recent history of the Bank, Sebastian Mallaby’s The World’s Banker (Penguin, 2006). In addition to his native South Africa, he has lived in the United States, Bangladesh, Mozambique, India and Brazil. He speaks English, Afrikaans, Bengali, Portuguese, and Spanish. Briscoe has served on the Water Science and Technology Board of the National Academy of Sciences and was a founding member of the major global water partnerships, including the World Water Council, the Global Water Partnership, and the World Commission on Dams. He currently serves on the Global Agenda Council of the World Economic Forum, on the High-Level Advisory Committee for the Murray Darling Basin Authority, as a member of the Council of Distinguished Water Professionals of the International Water Association, and as Senior Water Advisor to McKinsey and Company. His recent consultancies include for the World Bank, the Asian Development Bank, the US National Intelligence Council, and the National Water Commission of Australia.